The Colorado Plateau spreads over Utah, western Colorado, Northern Arizona and New Mexico and is the home to the greatest collection of National Parks on earth! 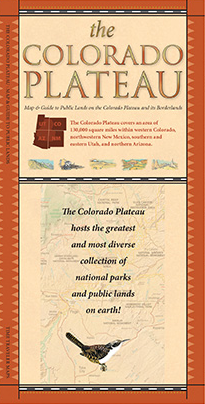 This unique guide and map features over 40 National Parks, Monuments, Recreation Areas and millions of acres of public lands. Each park is discussed with visitor services, activities, web sites and reservation phone numbers listed. The 26" X 36" shaded relief map reflects the commitment of Time Traveler Maps to "take maps to new dimensions" and offers a new folding method allowing its reader the ability to read both sides of the map without flipping it over.